Public memory is short. And, Dhani Ram Chatrik, who earned the title of “Punjab’s greatest lyric and poet,” seems to have been forgotten by Punjabi language lovers just after 50 years of his death. Chatrik was the first to standardise the Gurmukhi type. 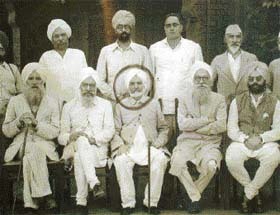 pre-Partition picture of Chatrik with Punjabi and Urdu writers. Chatrik authored Fullan Di Tokri (1904), Bharthri Hari Bikramajit (1905), Nal Dmaayanti (1906), Dharmvir (1912), Chandanwari (1931), Kesar Kiari ( 1940), Nawan Jahan (1942), Noor Jahan Badshahbe (1944), Sufikhana (1950) and many other prose and poetry books. Theatre reflects social and intellectual life of people. It impacts their minds even more directly than television and radio. Perhaps, it was this recognition of the importance of theatre that helped in the evolution of the Naatshala in the city. The Naatshala is, in all probability, the only theatre in the region, including Delhi, to have a fully automatic, revolving stage. Although the Municipal Corporation Amritsar is elated over the proposed ambitious waste management and thermal plant, which would produce electricity from garbage, little has been done to make the city clean. It is estimated that more than 500 tonnes of garbage is produced in the city every day. But night sweeping in the Holy City is non existent. 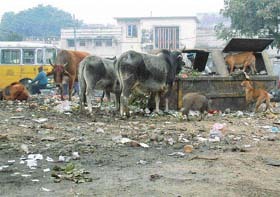 Garbage piles on the roadsides for days together attracting cattle, dogs and pigs. The site for the proposed project of the India Gate at the Chheharta-Atari bypass on the international Amritsar-Lahore road has turned into an accident-prone area. The project has been hanging fire for the last three decades. The vehicles, coming from the Atari Road, sometimes ram into the low-boundary wall encircling the three-way crossing. The Sultanwind area is a picture of neglect, thanks to the apathy of the municipal corporation. The area that came under the jurisdiction of corporation in 1978 still longs for development. The majority of the residents of the area are forced to drink contaminated water and many have fallen prey to waterborne diseases. Cool “snow white” is surprisingly the hottest colour this winter. With temperatures dipping, the cold wave has sent residents scurrying for woollen outfits. Complementing whites, off-whites, beige, camel and faun are jade green — the colour of vegetation in the thick of winters — electric blues, reds and oranges, purples, mauves and lilacs! When a person passes through this road, he sees how the police department has made its office on the main Grand Trunk Road, encroaching about half of the road. 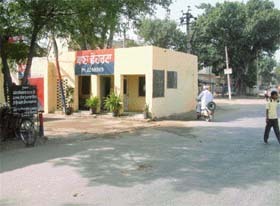 The police has extended the station by constructing the office of Station House Office on the road. This road further leads to the international Atari Railway Station and the Wagah joint check- post. Looking at the pathetic condition of the state-level pugilist Hari Lal, who is working as a part-time cobbler to make both ends meet, very few would think of choosing sports as a career. Thirty-one-year-old Hari Lal has been working as an SPO with the Punjab Police since the past one decade. He remained among the top three in the state boxing championships from 1989 to 1992. Keeping in view his punching ability, he was given a job in the Punjab Police in 1993. The dream of a budding artist Tanya to paint a gold plated portrait of Guru Nanak Dev in Tanjore style has finally come true. Her painting is being appreciated by art connoisseurs. 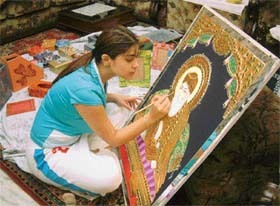 Already, she has received an order from an NRI from England to make a similar painting for him. Public memory is short. And, Dhani Ram Chatrik, who earned the title of “Punjab’s greatest lyric and poet,” seems to have been forgotten by Punjabi language lovers just after 50 years of his death. Chatrik was the first to standardise the Gurmukhi type. 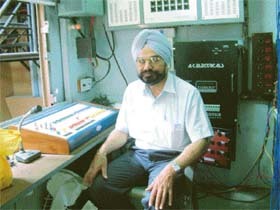 He had the honour of publishing the first volume of Guru Granth Sahib and Bhai Khan Singh’s “Mahan Kosh” (the first authentic dictionary of Punjabi), by using modern technique at his Sudarshan Printing Press. He was unmistakably the maker of modern Punjabi poetry. Many celebrity singers have earned crores of rupees by singing his songs. He was one of the seminal figures of the literary renaissance in the country at the turn of the last millennium. And today he’s a forgotten hero! 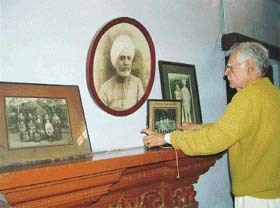 Chatrik became the founder-president of the Punjabi Sabha, which worked relentlessly to get Punjabi language an honourable status at the time when Urdu enjoyed the official patronage. A versatile and prolific writer, he used his pen in experimenting with different genres of Punjabi language. His vocabulary was fresh, and metaphor, tone and style employed by him were refreshingly new. Unmistakably, Chatrik was a towering personality who lived for Punjabiat. It was in the year 1998 that Mr Jatinder Brar, an engineer and technocrat industrialist with an obsession to revive stage and theatre activities, built a theatre with active cooperation from his wife, Ms Devinder Brar, and named it Naatshala. Located at the GT Road, opposite Khalsa College, the Naatshala was built near the factory owned by Mr Brar. Instead of selling the vacant land, he decided to make use of the land as a platform for upcoming artists. The idea was to promote the Naatshala as a place where performing arts could be encouraged. Theatre holds an important place in Mr Brar’s life, who says that he is committed to bring back the charm of theatre here. Theatre buffs have a free entry to most of the programmes hosted at the Naatshala. “What started as a mere passion has now become a 250-seater, fully air-conditioned auditorium, thanks to the active support of theatre buffs, a few of whom donate for the upkeep of the theatre,” says Mr Brar. Not only does the Naatshala have a fully automatic, revolving stage unseen in this region, the theatre boasts of sophisticated light and sound systems. It is equipped with acoustics, digital sound and stereophonic sound systems. The security of the theatre has also been taken care of with electronic fire extinguishers and special electronic circuits. As many as 398 plays have been staged at the Naatshala, with performances on every weekend by theatre groups from India and abroad. The famous Ajoka Theatre Group from Pakistan, too, staged their performance here. Some renowned artists, including Zohra Sehgal and noted artists from the National School of Drama, have left their stamp here. Interestingly, Mr Brar himself is a playwright. His plays Kudesan and Payedaan have celebrated golden jubilees. “The Naatshala has tried to bring back the tradition started by Mr Gursharan Singh, the icon of the Punjabi theatre, 30 years ago when he organised a play at Gandhi Ground,” says Mr Brar. He adds that theatre is an effective mode to divert youth from vulgarity and other crass entertainment towards more meaningful pursuits. The UK-based firm, Brind International Group, would invest Rs 200 crore in a project that would process 500 tonnes of the municipal waste daily to convert it into electrical energy. The invested amount would be recovered by the company in a 33-year period of lease by selling electricity either directly to private consumer or through the Punjab State Electricity Board. The municipal corporation would provide eight acres of land on lease for a period of 33 years. 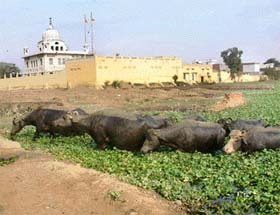 The land of the present dump yard in Bhagtanwala, near the largest Grain Mandi in the district, would be leased out for the purpose. Mayor Datti said the plant was likely to start in the next six months. Although the Municipal Corporation (MC) Amritsar is elated over the proposed ambitious waste management and thermal plant, which would produce electricity from garbage, little has been done to make the city clean. Dumps of garbage can be seen littering the majority of areas here. On one hand, the Golden Temple is being considered for inclusion in the world heritage list and on the other hand, the city is dotted with litter and garbage dumps. However, for the cash-strapped municipal corporation it may be rather difficult to clean the city, unless an unconventional approach is adopted, say experts. "Night sweeping" could prove to be a viable option to make the city a "Sifti Da Ghar" in true sense. In the pre-Partition times, Amritsar used to have narrow gauge steam locomotives whistling and chugging around the walled city early in the morning, pulling trains of 20-odd garbage cars. The town did not have underground sewerage at that time. The municipal committee at that time had well-oiled administration, and most of the sweeping and cleaning of roads and drains was done daily. In the early hours of the morning, British DC used to take a round of the city on his bicycle. Instant punishment was inevitable even for small lapses like a leaking drainpipe or a willful damage to road surface. But now "Guru Ki Nagri" is more populated, richer in resources and seemingly more advanced. It is estimated that more than 500 tonnes of garbage is produced in the city every day. According to estimates available in "Dairy 2004" of the corporation, 175 handcarts ply on the city roads and narrow lanes in order to ensure cleanliness. More than 270 societies, employing 1000 staff, besides 1500 regular sanitation workers, have been set up. Numerous containers and tractors, dumper placers and powered machinery are available with the corporation. But the level of sanitation leaves much to be desired. "Heaps of garbage lies strewn about. Stench of urine and night soil on the stretches of the Majitha Road, the Circular Road and the Ring Road is very common," says Prof Mohan Singh, President, Amritsar Vikas Manch. The municipal corporation, after taking all parties into confidence, should opt for night sweeping, he adds. "About a decade ago, Surat (Maharashtra), now one of the cleanest cities of India, used to be a picture of total disorder and mismanagement. But the administration was shaken out of its complacency when plague broke out. Do we want some similar disaster to befall our city?" Prof Mohan Singh asks. He suggests that the corporation should make garbage containers slightly bigger and also fence them properly. Garbage vans and rickety tractors also need replacement. "Open, leaking rubbish vans littering the city roads and blocking the traffic is not the best method of maintaining cleanliness. 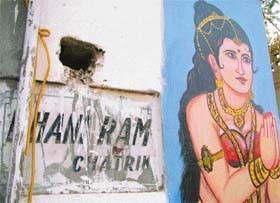 Moreover, facilities like urinals and restrooms that have been constructed in the walled city lose their very purpose if there are no signs or indicators telling public about these facilities," says a city resident. Most importantly, the municipal corporation should invoke the Punjab Municipal (Sanitation and Public health) Bylaws, 2003, circulated by the Department of Local Government on May 19, 2003. This prohibits certain acts, including urinating, spitting, depositing "malba" on the municipal roads. This law mentions punitive action for violating bylaws. Accordingly, executive officers would be responsible for implementing the provisions of the law. The city Mayor, Mr Sunil Datti, when contacted, said that night sweeping was definitely a good option. He added that the cooperation of the people was a must for this. He said that even though the corporation employees removed garbage every morning, the shopkeepers, who opened shops later, threw garbage on road again. He added that the corporation would soon launch a cleanliness campaign after holding meetings with associations of shopkeepers here. The site for the proposed project of the India Gate at the Chheharta-Atari bypass on the international Amritsar-Lahore road has turned into an accident-prone area. The project has been hanging fire for the last three decades. The vehicles, coming from the Atari Road, sometimes ram into the low-boundary wall encircling the three-way crossing. This is mainly due to the absence of streetlights and reflectors. The sharp turn around the large roundabout of the chowk, demarcated for the ambitious project, has aggravated the problem. High-beam light of heavy vehicles coming from the opposite direction makes driving even more dangerous. This route caters to VIPs crossing through the Wagah joint check-post as well as to the international "Sada-e-Sarhad" Delhi-Lahore bus service. 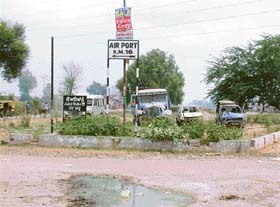 From this bypass, one road leads to the international Atari Railway Station and the Wagah joint check-post and the second to the Rajasansi Amritsar International Airport. On an average, one accident is being reported here daily in the late evenings, when tourists return from the Wagah joint check-post after witnessing the retreat ceremony. But only a few of the tourists register their complaints with the police. During winter season, when fog engulfs the area, the number of accidents rises. Years ago, the government had announced the construction of the India Gate at this bypass and accordingly land had been demarcated by the state government for this ambitious project. In October 24, 1977, a foundation stone was laid by former Chief Minister, Mr Parkash Singh Badal, with pomp and show to commemorate 400 years of the foundation of the holy city. However, no work was initiated even after more than two decades. While the foundation stone lies broken today, the platform where the stone was laid has been reduced to rubble. The chowk is being used by the police to "exhibit" non-functional vehicles, including trucks, jeeps and vans. Residents of nearby villages, who have witnessed many accidents here, alleged it was sheer negligence on the part of the municipal corporation and the civil administration. "Perhaps, the administration is waiting for some 'big mishap' to occur. Only then would it take the requisite measures," said Mr Jassa, a resident of a nearby village. He claimed that about 200 to 300 vehicles, including heavy trucks and army vehicles, crossed this chowk daily. Police employees posted at the India Gate Police Chowki, constructed near the bypass recently, while admitting the accident-proneness of the area, said that sometimes big mishaps were averted providentially. Named after a “Pir” Sakhi Sultan, Sultanwind has a historical importance. The sixth Sikh Guru, Sri Guru Hargobind, stayed here when he was returning after solemnising his marriage. Besides, Guru Hargobind, prominent Sikhs who came here included Baba Budda ji, Bhai Gurdas ji, Bhai Bahlo ji, Bhai Salo ji, Bhai Bidhi Chand. An old tree of “Karir”, where the sixth Guru tied his horse, still exists in the gurdwara. But the gurdwara, which is under the Shiromani Gurdwara Prabandhak Committee (SGPC), the sole authority responsible for the maintenance of gurdwaras, is in pitiable condition now. The Sultanwind area is a picture of neglect, thanks to the apathy of the municipal corporation. The area that came under the jurisdiction of corporation in 1978 still longs for development. The majority of the residents of the area are forced to drink contaminated water and many have fallen prey to waterborne diseases. For the locality, which has historical importance also, sewerage is a distant dream. The residents of the area alleged that the authorities and the political leaders had turned a blind eye towards them. There is no facility to provide clean and safe drinking water to the population of about 35,000 people of this area. They claimed that Sultanwind was inhabited much before the holy city itself. The main road passing through the area connecting the main G T Road from Dabourji side to Sultanwind Gate of the walled city is in bad shape. It was built to facilitate pilgrims’ easy reach to the Golden Temple. Due to this, the road was also known as the Golden Temple Road. The road, having only seven-foot width, has many potholes. This makes it accident-prone. Mr Ravinder Kumar Sultanwind, President, All-India Youth Association, claimed that the road was earlier also constructed by the Mandi Board, while the municipal corporation authorities in spite of having been given many representations, failed to construct it even once. Four gobar gas plants set up by government after spending lakhs of rupees about nine years back, are non-functional now. The residents of the area are using these plants for tying livestock and making dung cakes. Mr Sukhpal Singh Chouhan, a resident of the area, said that the plant was operational only for a few months after its commencement. The authorities concerned failed to maintain the plants. He said that some unscrupulous persons even dug out the pipes and iron wires surrounding the plants. Today, the site has become a favourite place for drug addicts. Interestingly, the Sultanwind area is famous for freedom fighters. A large number of freedom fighters, including Santa Singh, Janmeja Singh, Gurmej Singh, Master Waryam Singh, belonged to this village. As many as 135 inhabitants of the area also took part in the First World War and seven of them were martyred. The then-authorities, pleased with their bravery, made a police chowki here, which still exists. The only dispensary situated in the area was disbanded about 10 years back and was not re-established. The dispensary, named after freedom fighter Santa Singh, used to run in a gurdwara. However, due to collapse of the roof of the gurdwara, the government ordered the shifting of the dispensary. But it was not started again, alleged Mr Ravinder. He added that the family of Santa Singh was ready to give land, but the authorities, citing paucity of funds as the reason, had failed to start the dispensary again. Mr Sunil Datti, Mayor, said that a proposal had already been sent to the authorities for releasing the funds for the development of the area. He added that as soon as the corporation got funds, it would start work at Sultanwind area. Cool “snow white” is surprisingly the hottest colour this winter. With temperatures dipping, the cold wave has sent residents scurrying for woollen outfits. Complementing whites, off-whites, beige, camel and faun are jade green — the colour of vegetation in the thick of winters — electric blues, reds and oranges, purples, mauves and lilacs! Mr Gurpreet Boparai of the “No Exit” feels that the fast-changing fashion trends in the past few years have helped boost sales. Daring outfits like off-shoulder sweaters, halter neck jackets reminding one of Kamolika of “Kasauti Zindagi Ki” tele serial, have cast a spell on youngsters, who are all eager to experiment with bold designs. While cargo pants in fawn, blue and brown, camouflage fatigues, track pants with coloured patches are favourite casual wears of women this season here, curved sports shoes and pointed footwear for men, too, are gaining currency. 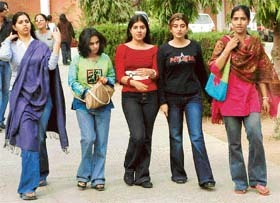 In women’s section, long ethnic skirts with ethnic tops, bell-bottom, boot-cut and low-waist stretch pants are attracting college and university students. Colours such as fushia pinks, turquoise, whites, silvers and dull gold in lycra are in demand, particularly in coats and jackets, says Mr Vishal Aggarwal of the “Exotic” outlet. Jamavar coats, kurtis, stoles combined with ponchos and woollen skirts also have many takers. However, long and ankle-length boots no longer make a fashion statement here. Even the trend of pointed footwear is fading out. Mr Gursharan Singh, “Fancy Hatti” readymade garments store in the walled city, says that customers prefer rust, black and blackish-grey and that green is also picking up. Sale of woollen and denim jackets in routine colours, including black, navy and mustard, remains more or less the same, he adds. No wonder, many prefer to frequent the Landa Bazaar and other Sunday markets, where woollens can be bought at throwaway prices that suit the budgetary compulsions of many residents. When a person passes through this road, he sees how the police department has made its office on the main Grand Trunk Road (GT Road), encroaching about half of the road. The police has extended the station by constructing the office of Station House Office (SHO) on the road. This road further leads to the international Atari Railway Station and the Wagah joint check- post. More than 50-foot road from one side has been reduced to about 25-foot at this point. Not only this, the area in front of the constructed portion is being used to keep seized, damaged and case property vehicles. This often leads to traffic chaos on the road. With the recent thaw between India and Pakistan, the number of delegations and tourists from the neighbouring country has increased manifolds. These delegations and tourists pass through this road daily. What impression this encroachment leaves on the minds of the commuters is anyone's guess. It is unfortunate that the Punjab Police, which is the premier agency for upkeep and maintenance of law and order, including helping the municipal corporation to remove encroachments in the district, is itself indulging in this illegal act, says a commuter, who frequents the road. Mr Amarjit Singh Ansal, District Secretary, CPI, alleged that the encroached police station had led to many accidents. He explained that when people came in groups to the police station, it often resulted in hindering the smooth flow of traffic on the GT Road. He added that the police had recently lathi-charged protesting shopkeepers in Pultighar area, who were agitating over a dispute involving encroachment-removal by the police. "How could the police, which itself has encroached upon the government land, be a responsible agency to remove encroachments? It seems so strange," he added. The city Mayor, Mr Sunil Datti, however, could not be contacted even after repeated attempts. Looking at the pathetic condition of the state-level pugilist Hari Lal, who is working as a part-time cobbler to make both ends meet, very few would think of choosing sports as a career. Thirty-one-year-old Hari Lal has been working as an SPO with the Punjab Police since the past one decade. He remained among the top three in the state boxing championships from 1989 to 1992. Keeping in view his punching ability, he was given a job in the Punjab Police in 1993. Even after putting in about 11 years of service, his job was not confirmed. Managing his family with the meagre salary of Rs 2700 per month was proving tough for him. Besides his wife, there were three sons to support. 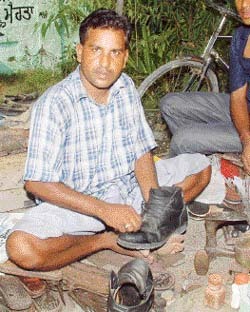 So, he took up the job of mending shoes and started working as a part-time cobbler. He has repeatedly written to the police authorities about his case and reminded them of his long-overdue confirmation, but to no avail, he says. “I work in a makeshift shop when I am free,” he tells us. He adds that he was inducted into the police force with the assurance of “confirmation after some years of service” by the then-SSP. However, even after 12 years, the assurance remained unfulfilled. Mr Hari Lal first participated in the Sub-Junior Punjab Boxing in 1989. The next year, he bagged a silver medal in the Punjab Junior Boxing Championship. In 1992, he participated in the state senior boxing championship and bagged the third position. The very next year he was given a job in the Punjab police. He was a champion for three years from 1994 to 1997 in the border zone police games. He clinched a silver medal in the North Indian Boxing Championship held at Pinjore in 1994. Starting her training at her alma mater BBK DAV College for Women, she is fast gaining her foothold in the art world. Her talent was acknowledged and recognised when she won the top honours in on-the-spot wood-furnishing competitions, in which she received digital video camera as the first prize. She is also well-versed in the modern buckram art. These days, she’s busy conceptualising the interiors of a showroom, whose designing has been entrusted to her. All this at the age of 22!